“Proudly not pay-to-play, we invite all of this years’ recipients to share their success through a complementary digital certificate and copyright to the title.” So claims the award letter. We received this email to our corporate info@ address last week. Can you smell the scam? Interestingly, the signature block is a graphic, probably to elude spam filters. The company is AI Global Media, who did not reply when we wrote to “Chelsea” with questions. But then again, given they “spent recent months examining the achievements of thousands of business leaders and looking at the contributions they have made to their companies, as well as their accomplishments over the course of the previous year,” and picked as their sole Arizona winner a small tech consulting firm which serves about a dozen clients…. what would you expect? 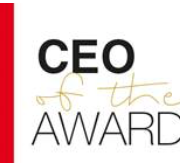 The CEO awards were founded to identify and recognise the outstanding leadership of CEOs across all industries and jurisdictions and will be commending just one CEO from each region and each sector. We have spent recent months examining the achievements of thousands of business leaders and looking at the contributions they have made to their companies, as well as their accomplishments over the course of the previous year. In terms of determining those most deserving of this coveted accolade, we take into consideration significant achievements from the past calendar year, other accolades won, length of service, company performance since you took position at the helm (or since day one for those who have founded their businesses), as well as client testimonials and recommendations. Proudly not pay-to-play, we invite all of this years’ recipients to share their success through a complementary digital certificate and copyright to the title. If, on the other hand, you would like to really capitalise on this good news and reach more than 108,500 industry peers and potential clients, we have three packages for your consideration. Please note that P&P and (where applicable) VAT is charged in addition. NB: The main front cover image is also currently available to purchase on a first come first served basis at a further price of 2,200 GBP. If this may be of interest please do let me know. We have an entirely in-house editorial and design team who will assist you in putting together all items associated with your package, making the process as convenient for you as possible. Trophies and logos are available to purchase separately on request also. If you would like to move forward, simply respond confirming your chosen package and its associated price, for example ‘Agreed, The Principal Package – 895 GBP’. Once I have received this I will forward your information over to our editorial team who will begin the creative process with you. Should you have any questions or require more information regarding this programme, the packages, or the magazine in general, please don’t hesitate to get in touch and I will be more than happy to help. I look forward to receiving your response, Carole. Artificial Intelligence and Machine Learning are the future of software dev... Artificial Intelligence is everywhere!